The world of sample swapping is alive and well on Reddit. Post what you want, and post what you got. Sooner or later, you hear from a few follks, conversations start, and the next thing you know you are sending samples in the mail and receiving them. I love it. I love being able to try stuff I haven’t opened or things I can’t get very often in my area. A recent trade netted me a few samples I didn’t have, one of them being a Willet Family Estate 6 Year Rye. Coming in at 114.6 proof, this fine smelling specimen met my belly tonight. How did it stack up against baby Saz (6 year Sazerac Rye)? Very well in my opinion. The nose on the Willett Family Estate 6 Year Rye is nice and smooth, and reminds me of a caramel cake. Deep inhales burn a little, like spearmint. Further whiffs make me think of butterscotch, grass clippings, and the smell of freshly fallen leaves in the Fall just after a rainstorm. I know that smell very well because every time I go for a run in the fall after a rainstorm, I smell bourbon and rye whiskey the entire time and it ruins my run. My first two sips were not nice to me. A pleasant taste of honey and caramel hit me initially, and the familiar rye taste. But it quickly was replaced by a very spicy flavor. I told my wife it reminded me of those little red hot candies. It burned for about 30 seconds, the second time, almost a minute. It wasn’t totally unpleasant, but the finishing spice lingered more than I wanted it too. I added a few drops of water and that dropped it down very nicely to an almost perfect level for me. After a little bit of water, I really enjoyed it. Vanilla and honey on the sip, cinnamon candy and caramel cake on the finish, with that beautiful rye taste lingering for awhile. It doesn’t have a lot of age in the flavor, not much wood or leather or tobacco, but it has more spice and depth than baby Saz. 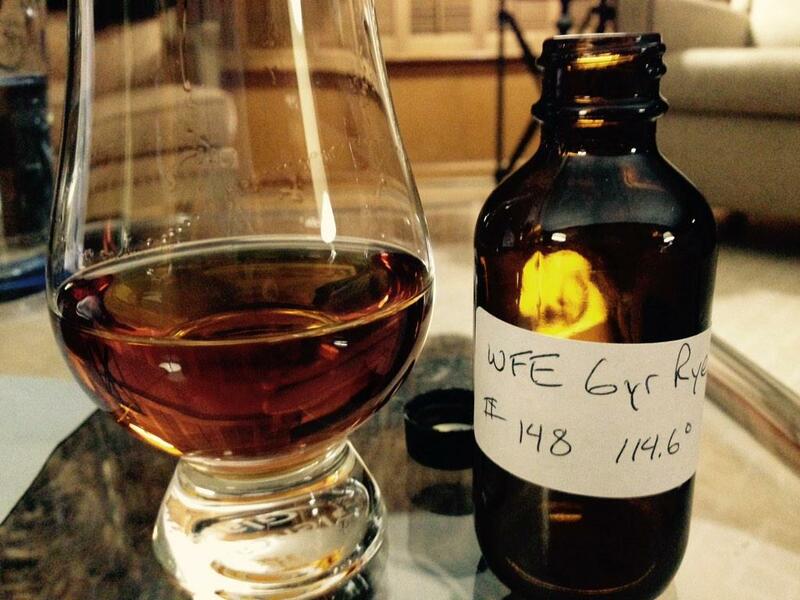 It was just a 2oz sample, but I enjoyed it enough to seek out more of the WFE ryes. Maybe one of their really old ryes will take down my current king, Sazerac 18.